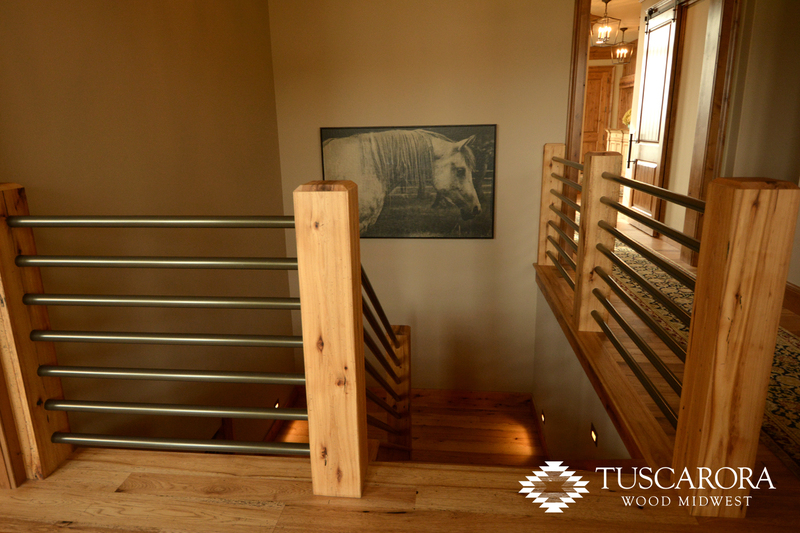 This is the third, and final, installment in a series of features which follows reclaimed wood from the abandoned barn it came from, through our mill shop, to the finished product installed in this new home. 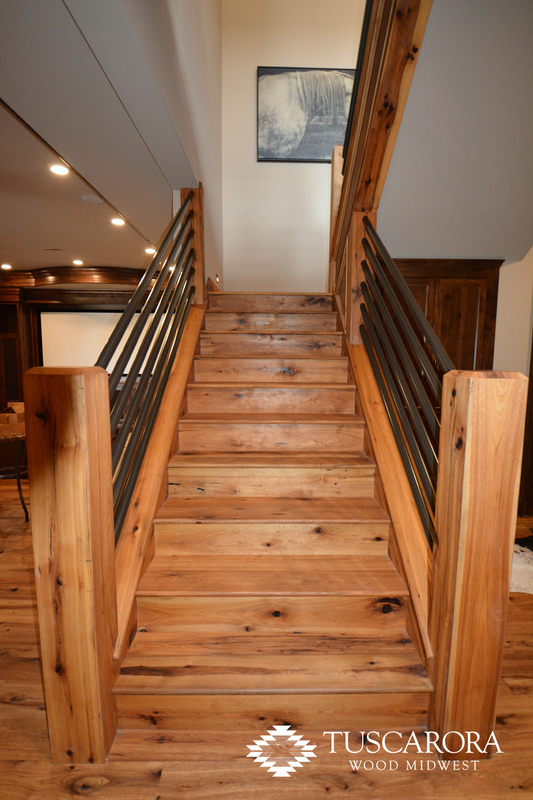 The first feature showing the barn wood being reclaimed can be viewed here. 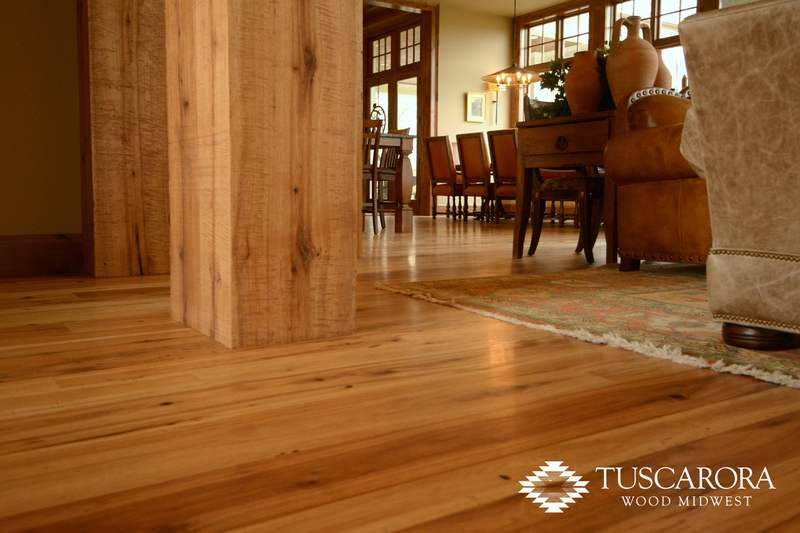 The second feature showing this wood being processed in our mill shop can be viewed here. 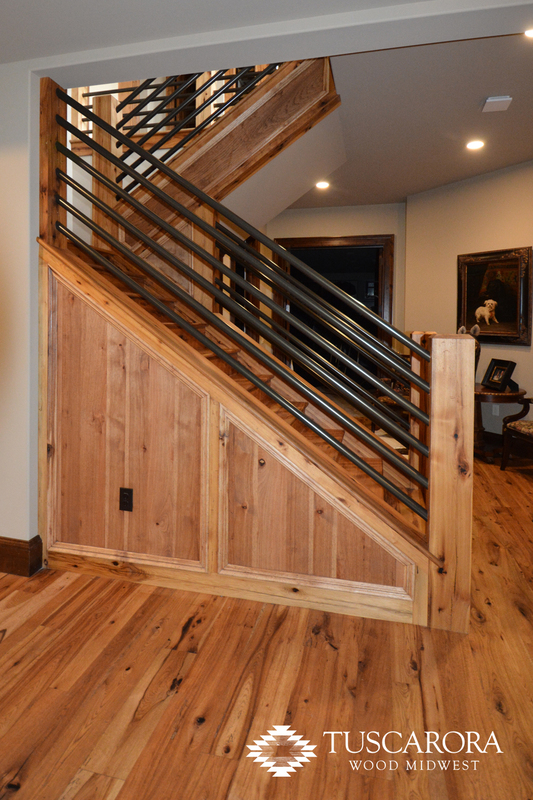 From “forgotten to unforgettable” really does describe the transformation of this Hickory barn wood. 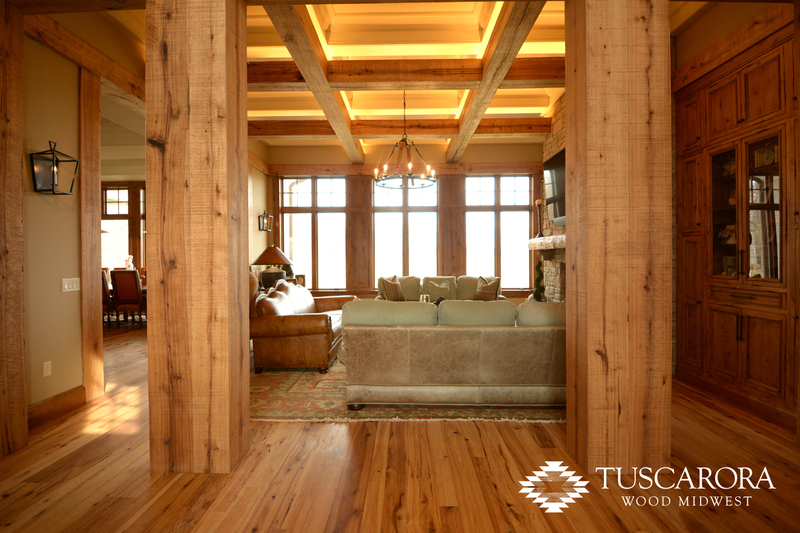 To imagine that the abandoned barn and rustic old beams seen in our first feature could become the stunningly beautiful wood in this new home is hard to believe. 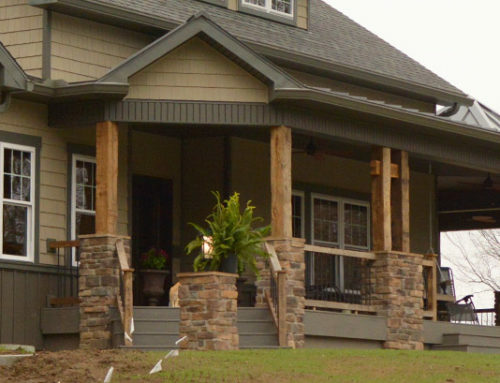 Huge shout out to Harlow Builders of Troy, Ohio and their amazing work on this new home! 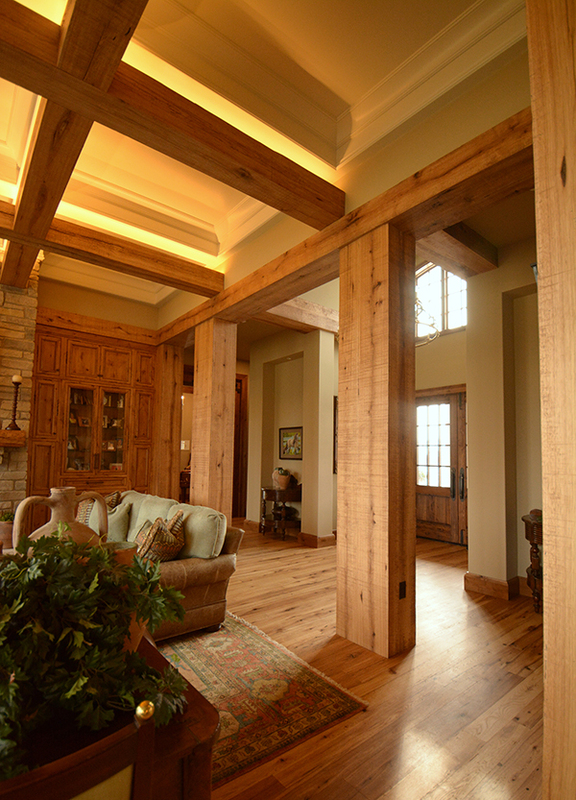 As you walk into this home you’re greeted with absolutely massive box beam pillars. 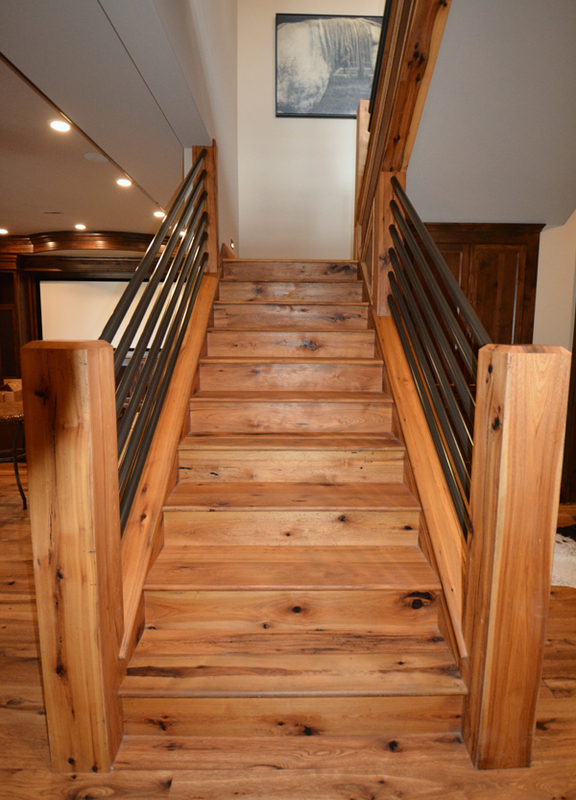 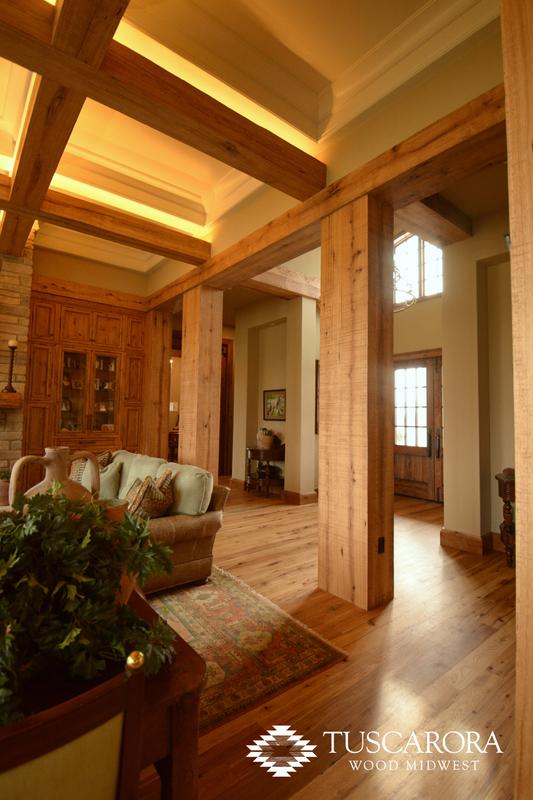 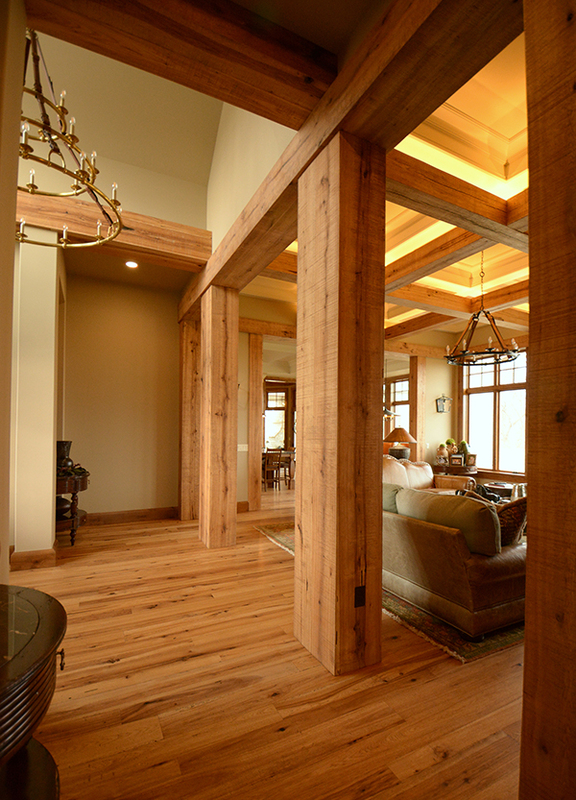 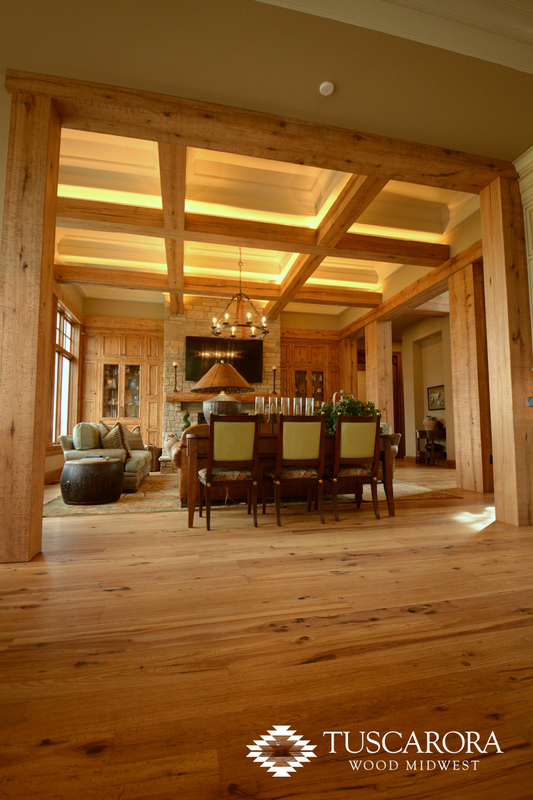 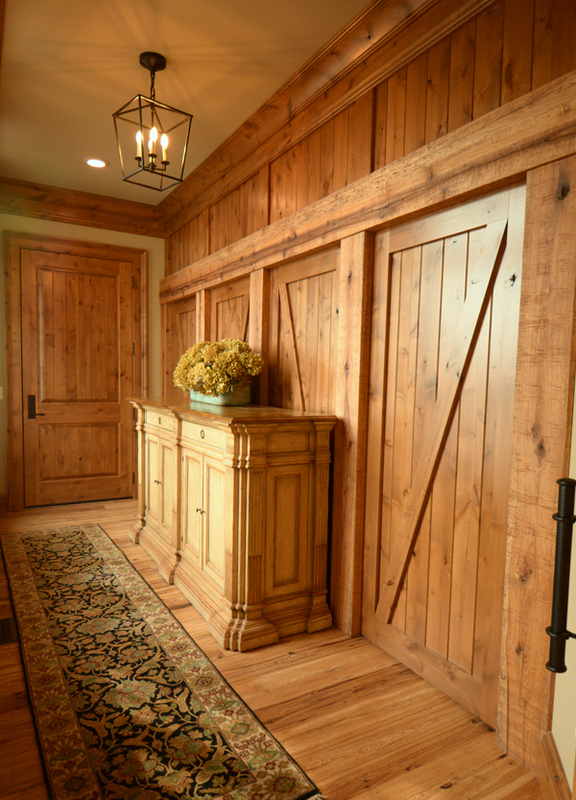 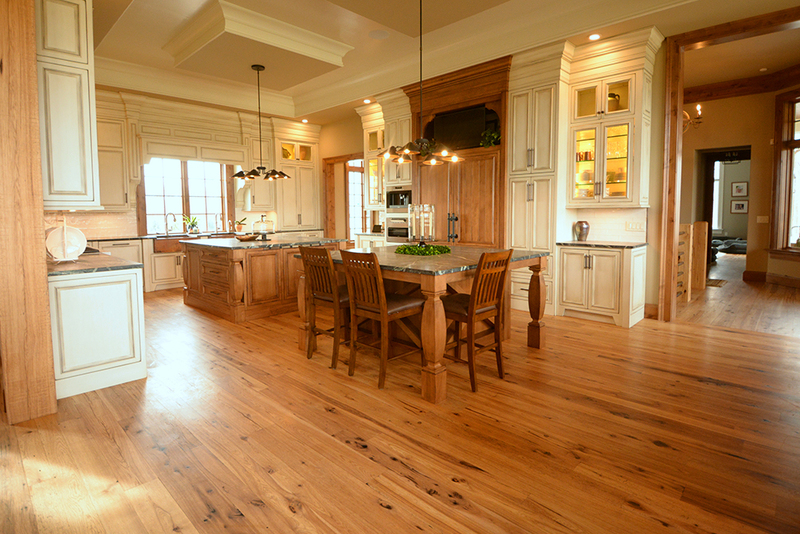 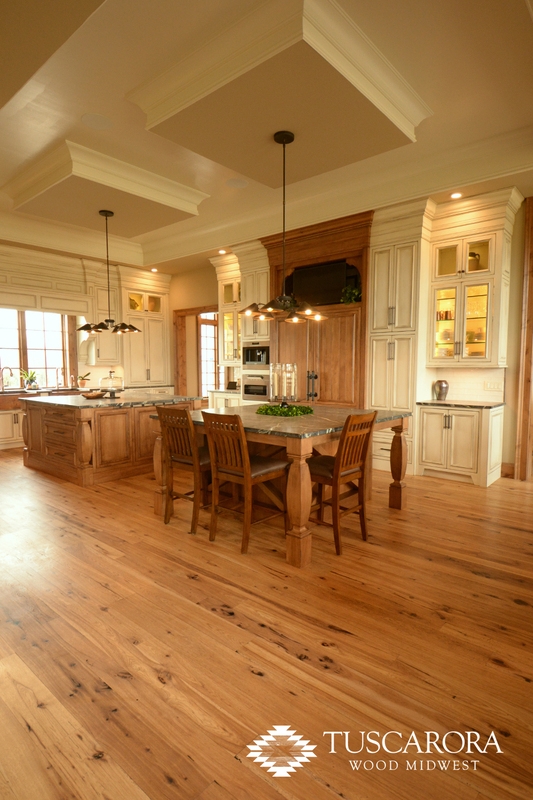 A mix of these massive Hickory timbers, both solid and boxed, can be found in plenty throughout this new home build. 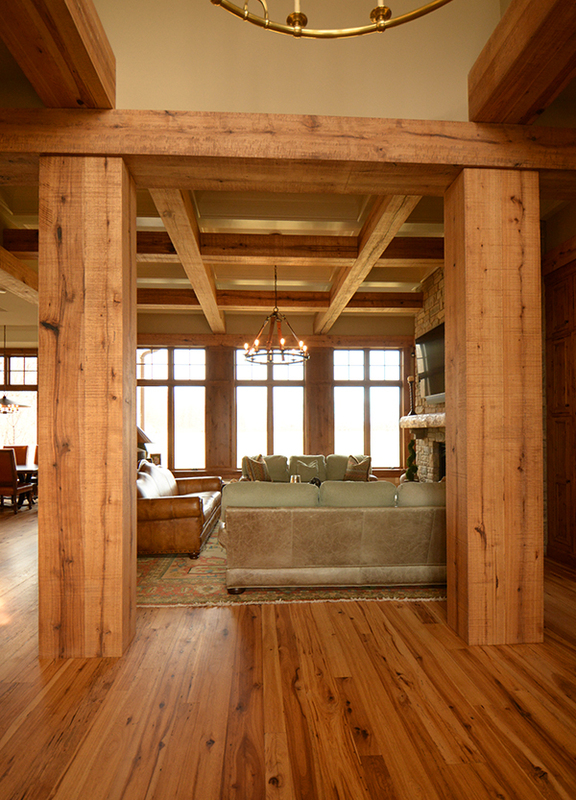 The culmination of which is the awe inspiring ceiling beams in the main living area. 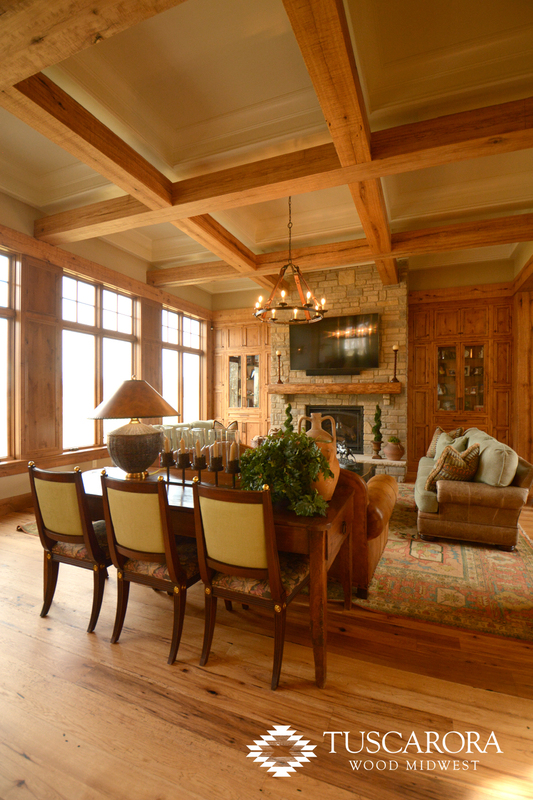 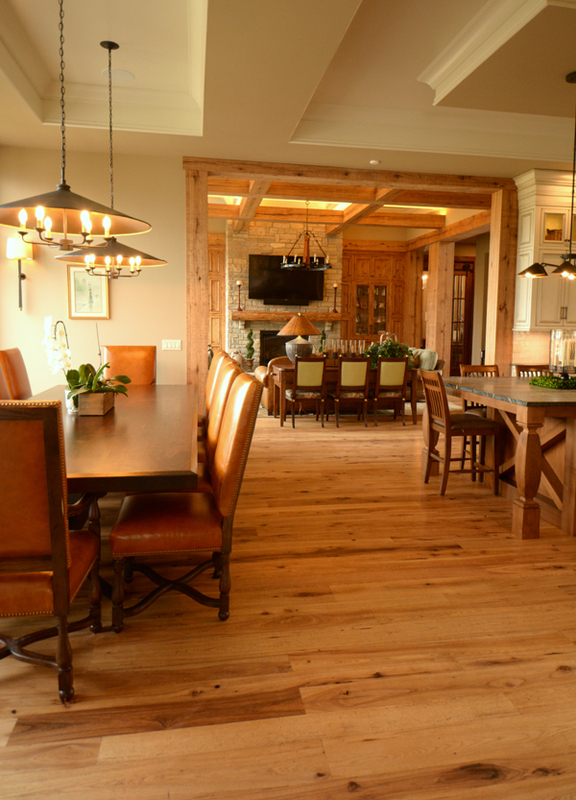 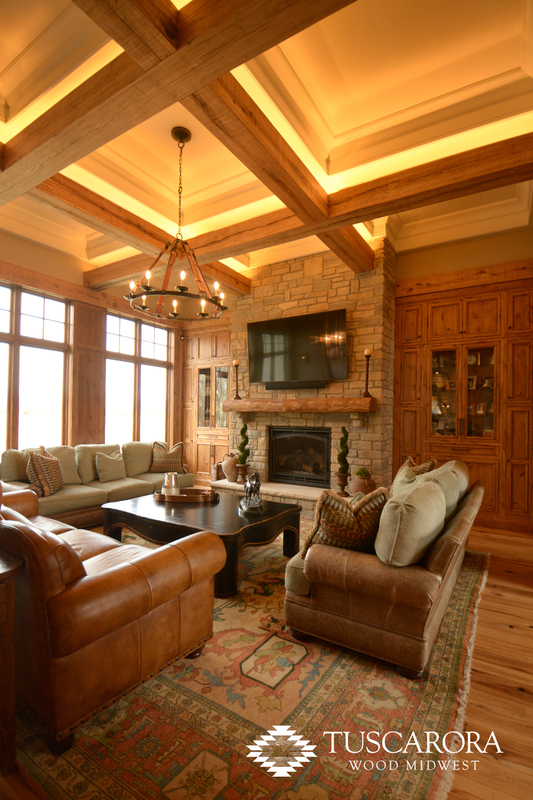 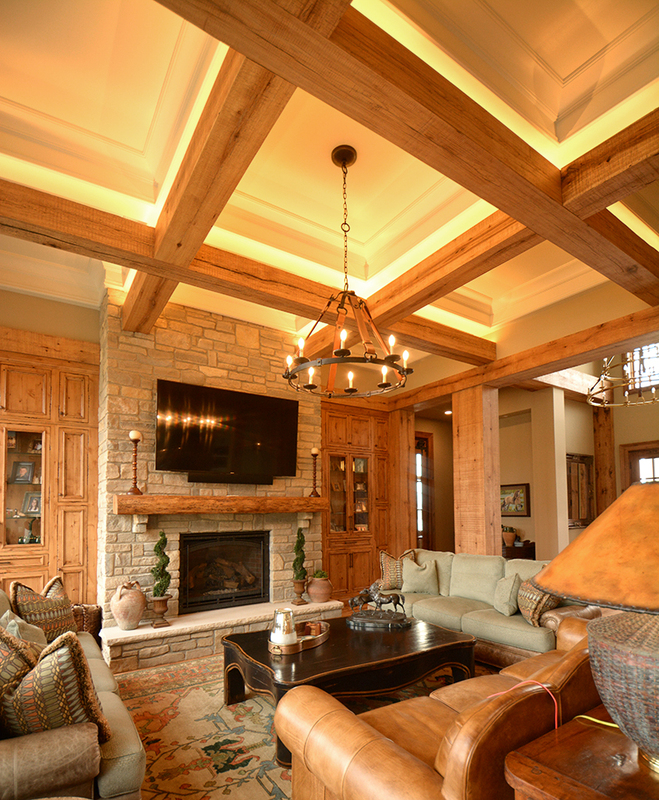 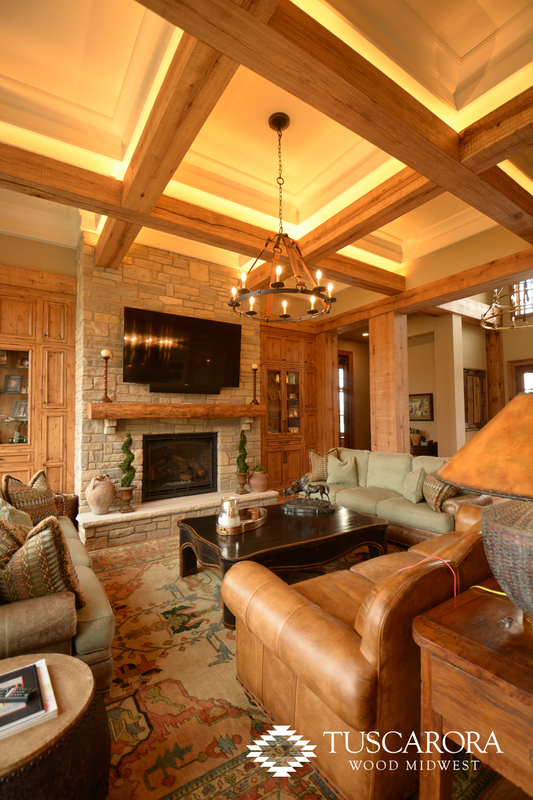 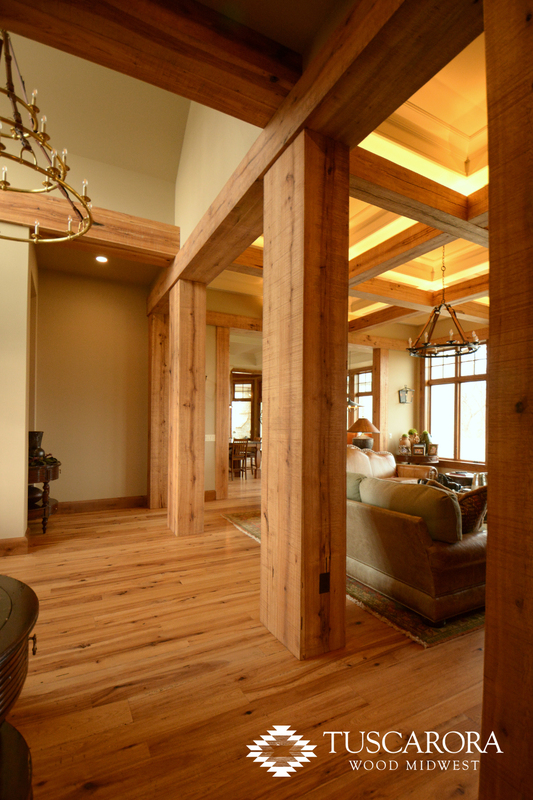 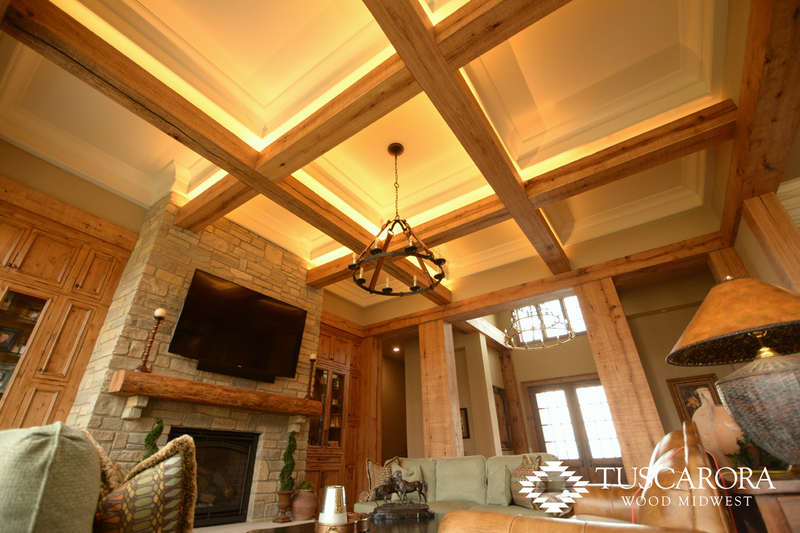 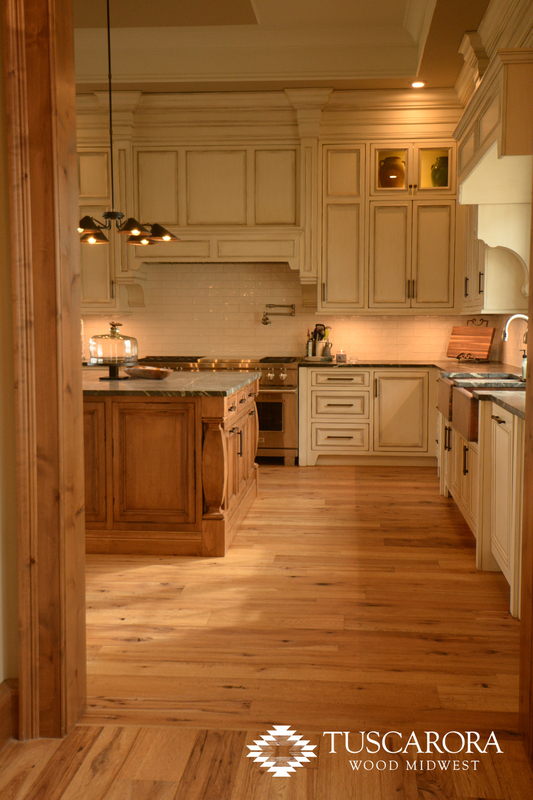 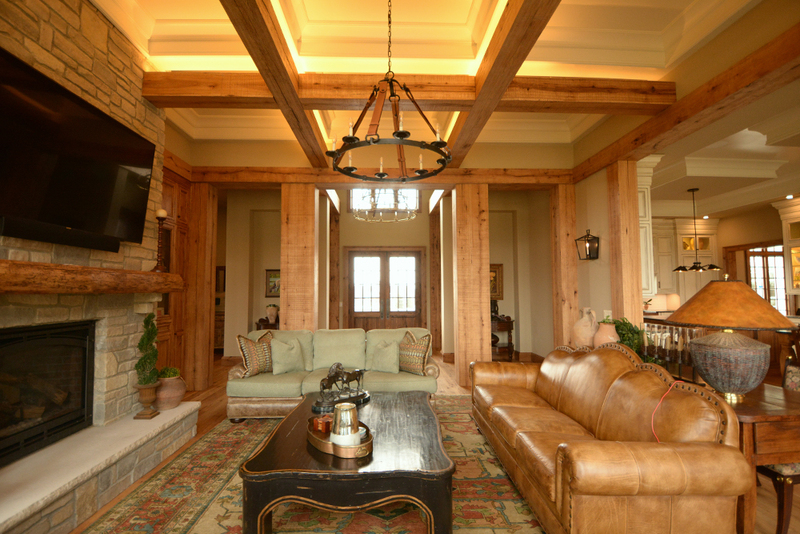 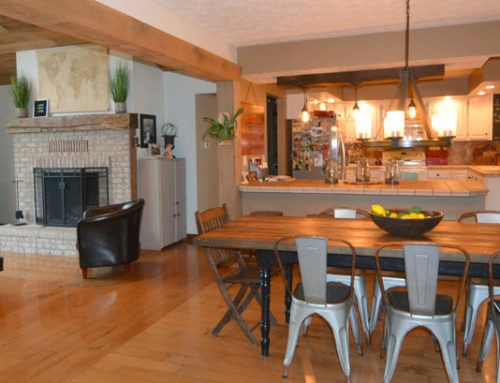 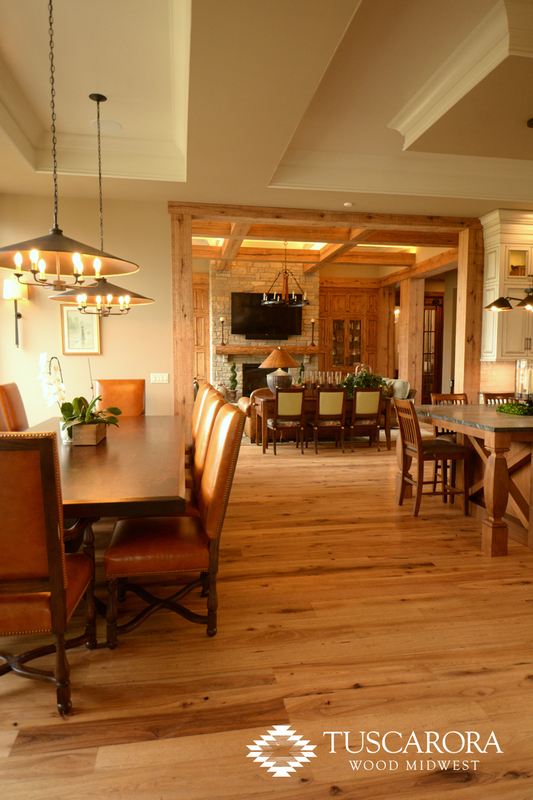 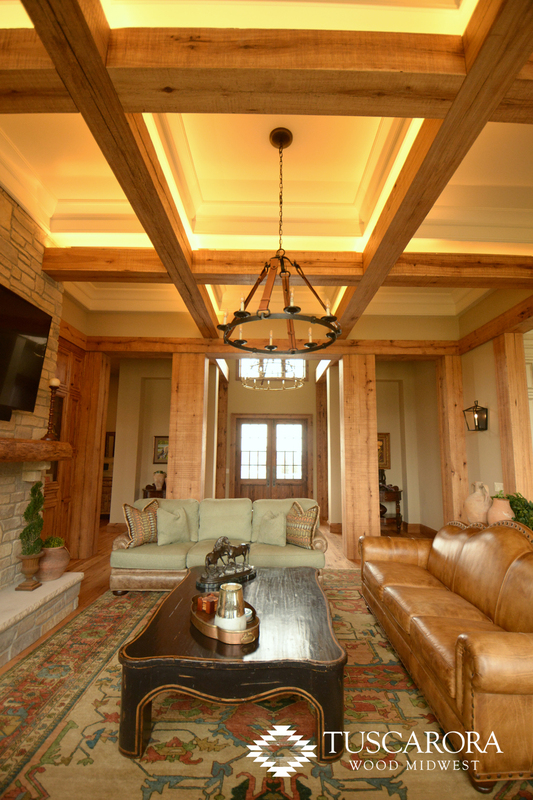 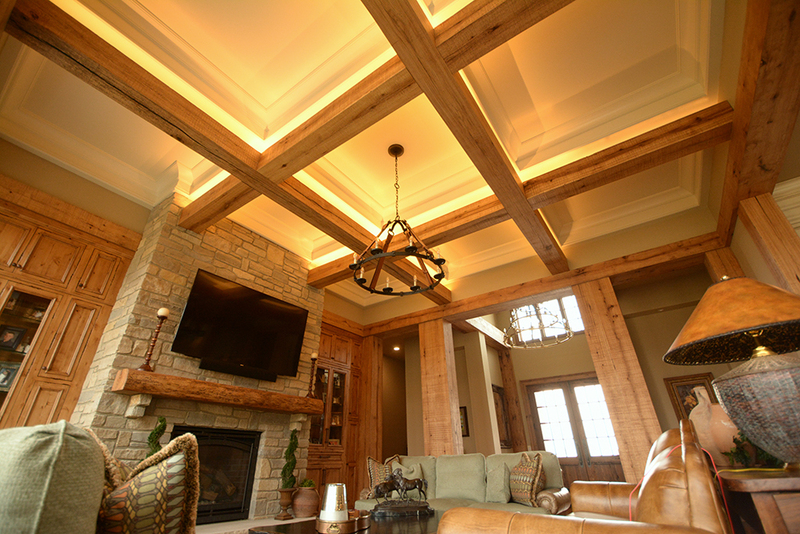 Complete with recessed lighting, these rustic beams add touch of elegance to this space. 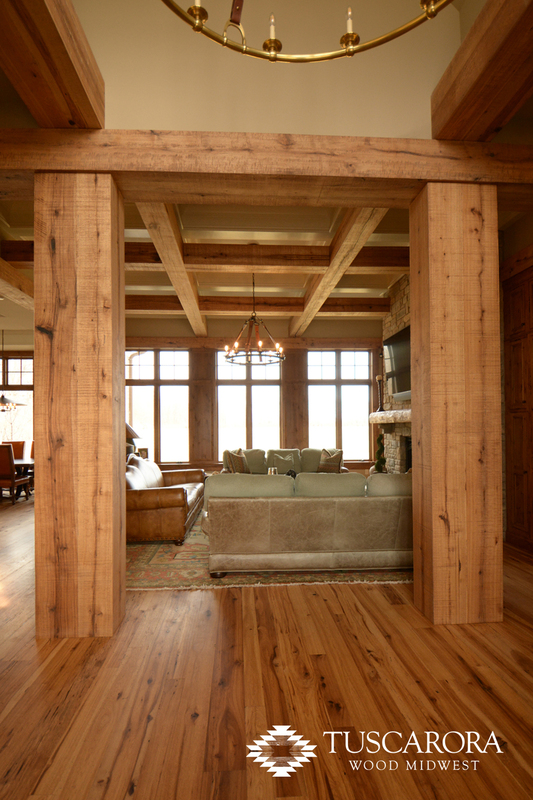 The only semblance of the original hand hewn floor joist beams from the original barn is seen in the solid Hickory beam fireplace mantel. 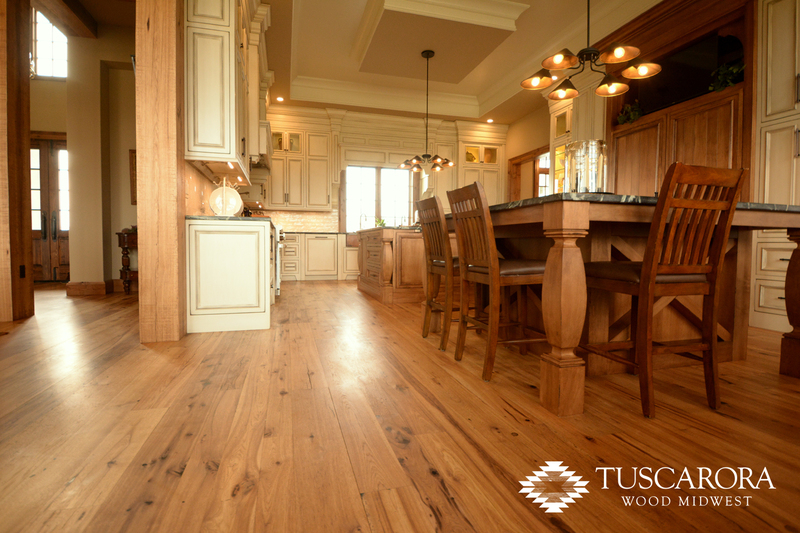 Even with all the precision beamwork in this home, one thing that certainly doesn’t go unnoticed is the beautiful Hickory hardwood flooring. 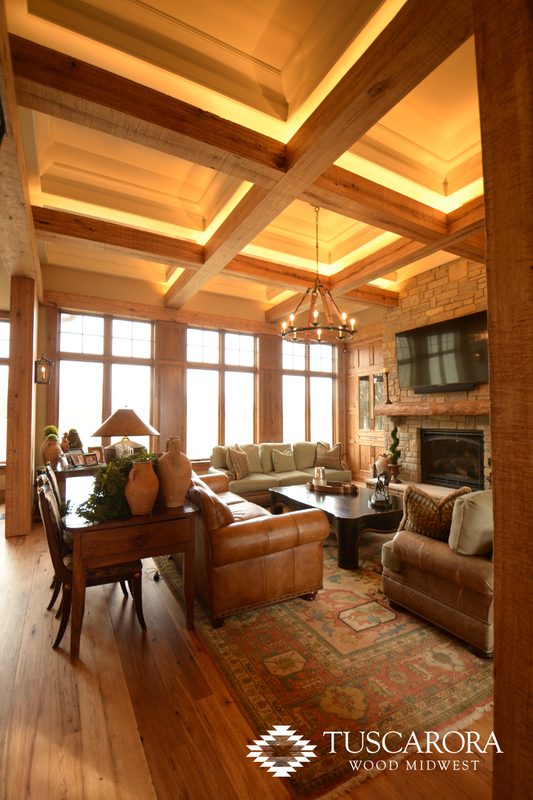 And, it’s hard not to take note as there is more than 5,500 sq. 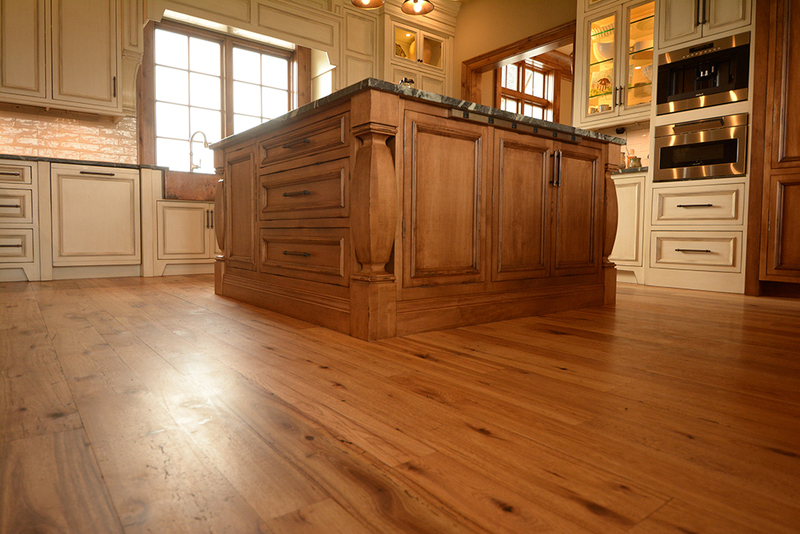 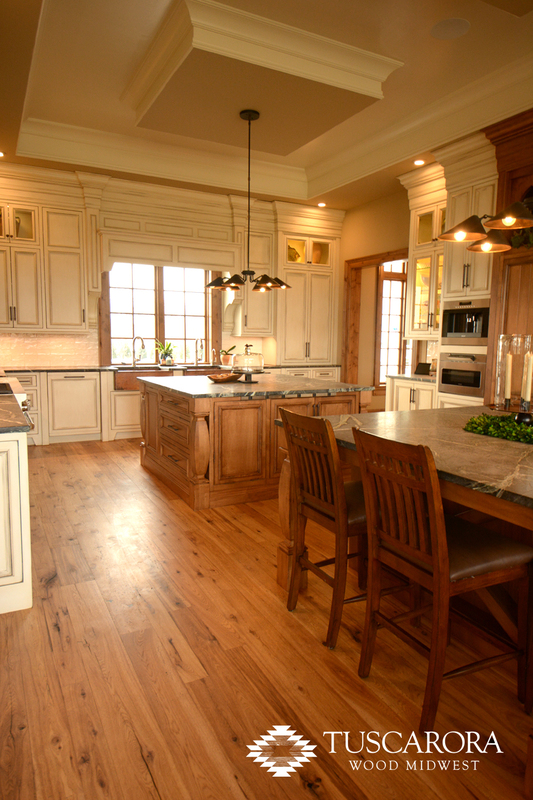 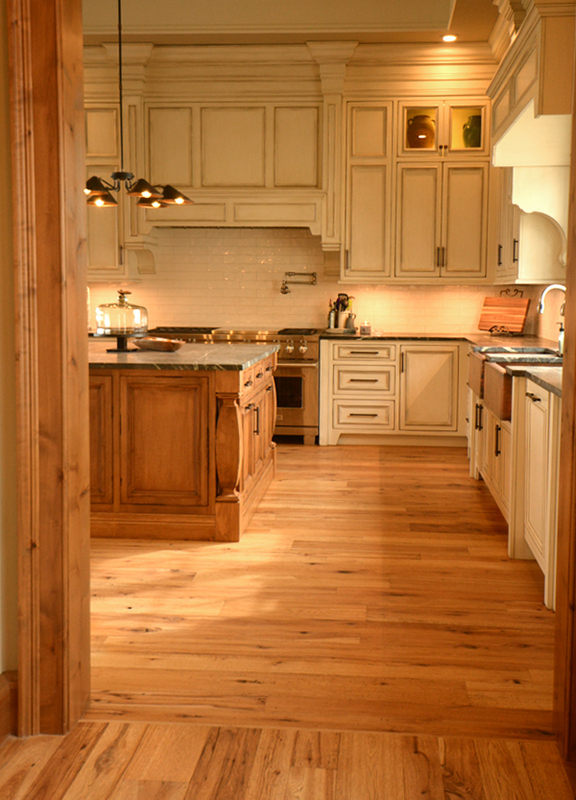 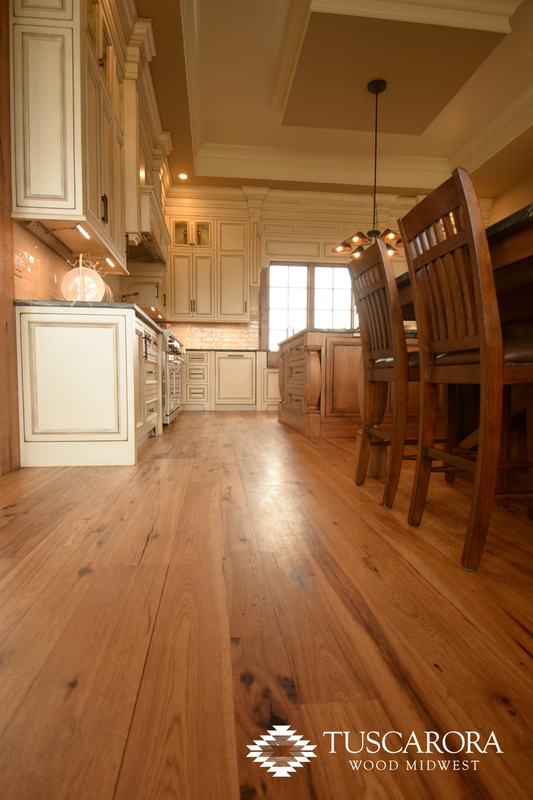 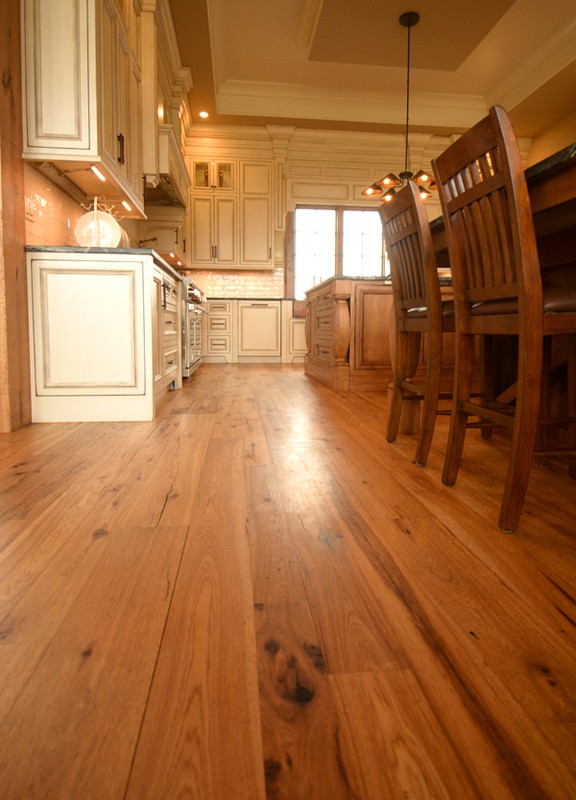 ft. of this gorgeous flooring installed throughout the home! 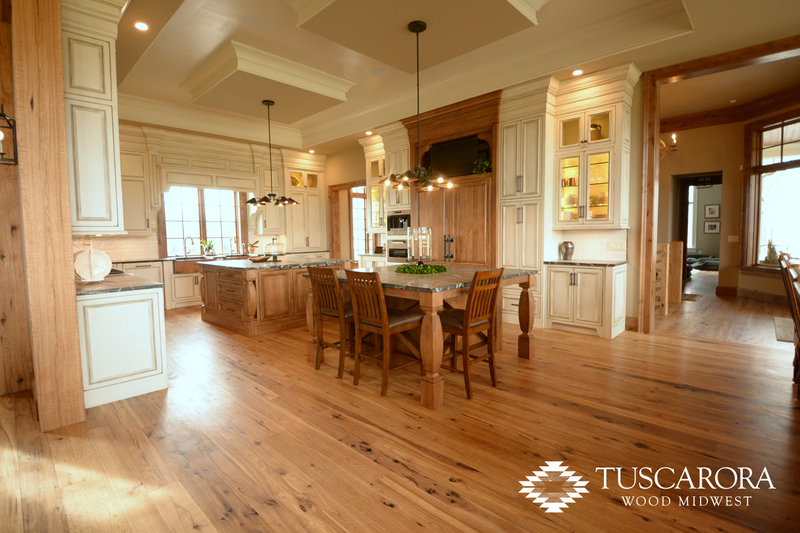 The natural patina of the Hickory hardwood creates a warm and luxurious environment that is absolutely inviting to anyone walking into this home and having been finished with a Woca Diamond Oil, the wood grain really comes to life. 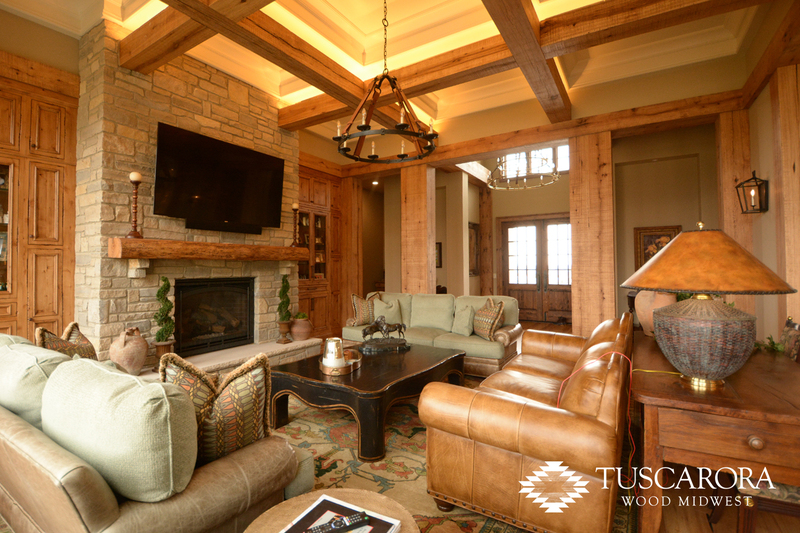 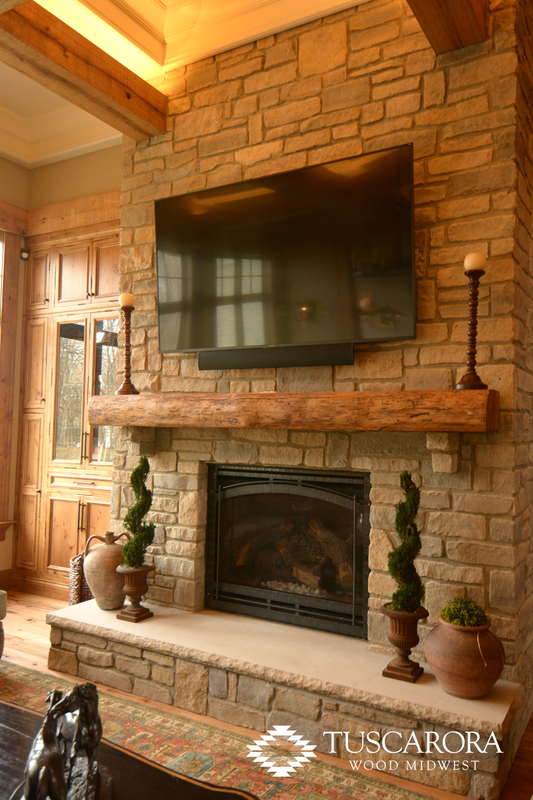 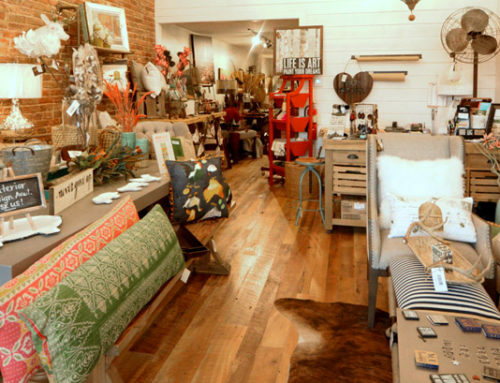 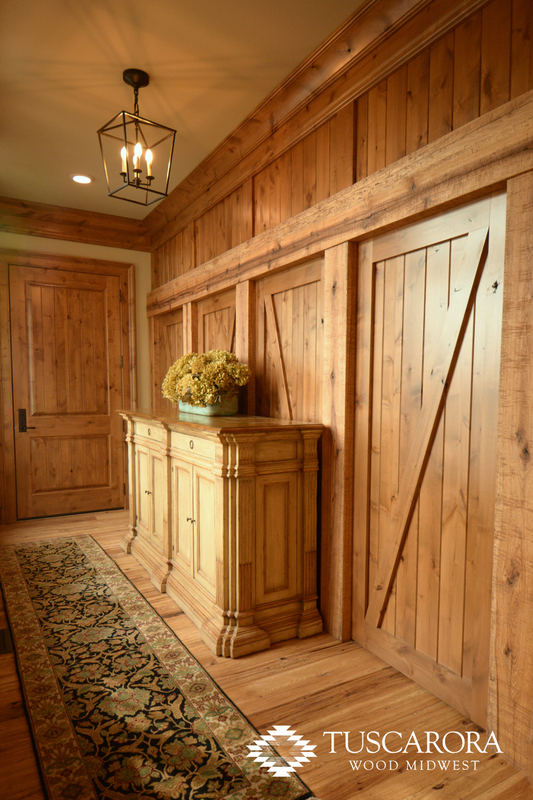 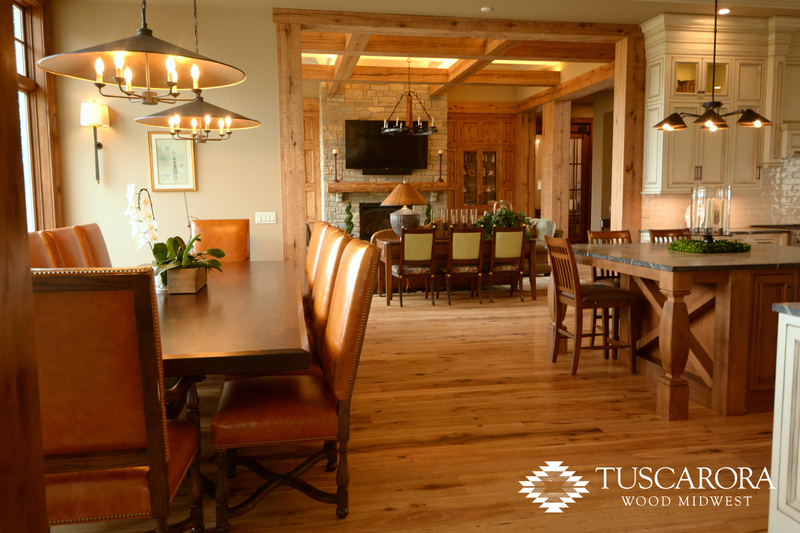 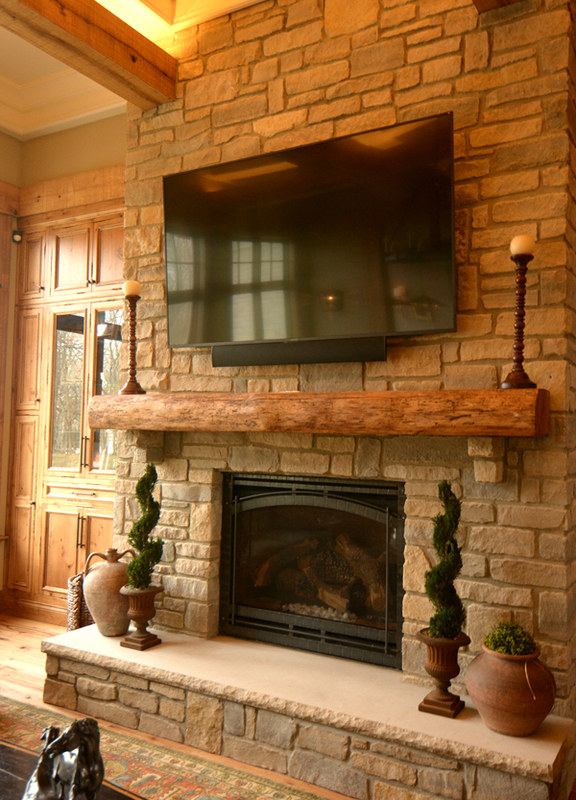 At Tuscarora, it’s our passion to work closely with our partners and customers taking forgotten wood and transforming it into products that are truly unforgettable. 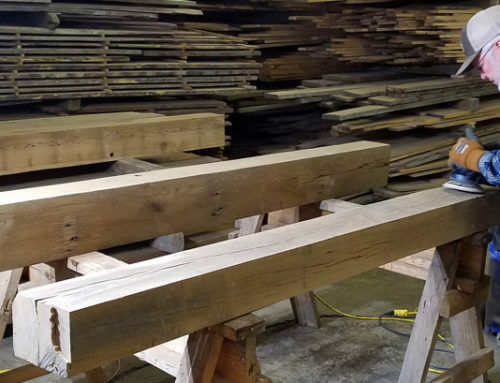 Each order of reclaimed hardwood is completely custom milled to meet your specifications by our small and dedicated team. 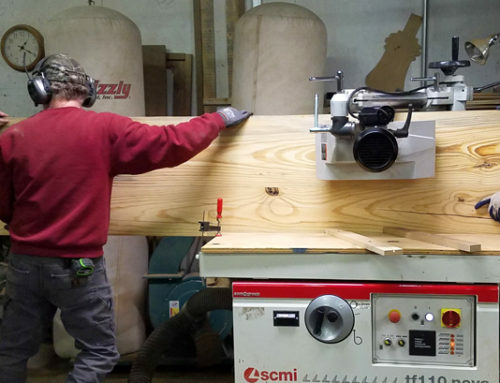 If you haven’t had a chance, we encourage you to take a look and read through the first and second features on this Hickory wood to see the passion of our team and their dedication to this work.